Sacred Symbols of an Intact Ecosystem – Only 5 Spaces Available! Forgive yourself if your first Spirit Bear photographs turn out a bit blurry. That’s because it’s almost impossible not to tremble with excitement and awe the first time you witness a Spirit Bear materialize from dark, dense, moss draped old growth. Instantly, you understand why the First Nations peoples of the area refer to this magnificent creature as Moksgm’ol, the Ghost Bear. Everything about Spirit Bears is special. They are one of the rarest bears on earth, with perhaps 200 to 400 in existence – no one knows for sure. They reside only in the pristine environs of the Great Bear Rainforest of coastal British Columbia, the largest temperate rainforest left on the planet. Neither a polar bear nor an albino, science explains Spirit Bears as the product of rare recessive genes. But to the First Nations peoples of the area they are sacred symbols, Ghost Bears, their unique coloration the result of an ancient bargain made with the creator, Raven, to remind us of an age when the world was covered with ice and snow. 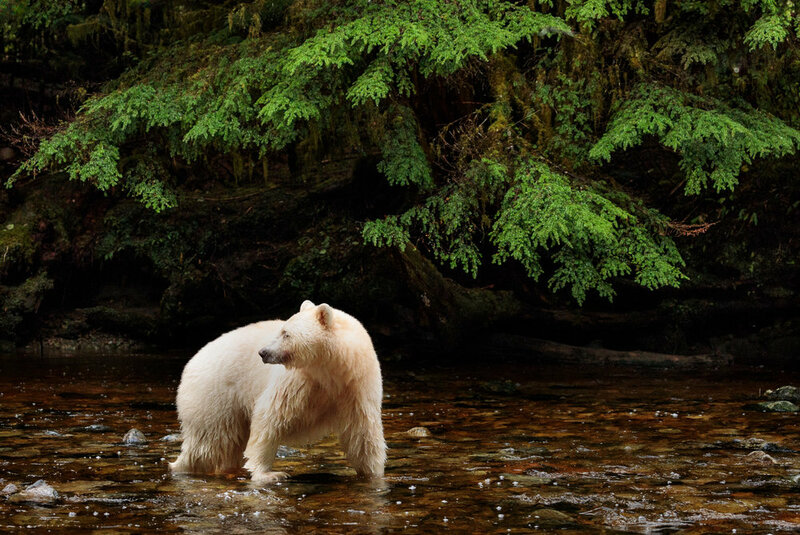 Opportunities to photograph Spirit bears are almost as rare as the animals themselves. Most of the time, they lead solitary lives deep inside inaccessible rainforests. But for a few weeks each autumn, spawning salmon coax them to gather along coastal streams where they feast on Mother Nature’s annual abundance. Access to these areas is under the control of the local First Nations peoples like the Gitga’at. Practically speaking, the only reasonable chance of seeing and photographing Spirit bears in the wild is to join an organized trip sanctioned by a local First Nations group. Our partnership with Gitga’at guide, community leader and “bear-whisperer”, Marven Robinson allows 5 lucky photographers to participate in a wildlife photography opportunity of a lifetime. Although there are no guarantees, every aspect of this trip including timing, hours in the field, instructional sessions and one-on-one coaching with Ken is designed to maximize the opportunities to bring home portfolio worthy images of Spirit Bears and other wildlife. What's Not Included: Airfare to/from Prince Rupert, Meals & Lodging in Prince Rupert, Personal Expenses, Gratuities & Anything not speciifically listed as included.